Alton Brown always brings out the mad food scientist in me. Last week I was watching an episode about sausage on his show, Good Eats, on the Food Network. Naturally, I decided I simply had to make my own homemade sausage. But before I could settle on what kind of sausage to make, I had an “Aha!” moment. Homemade sausage and simple, comforting breakfast foods would be wonderful recipes for this month. The foods we eat are very interesting and tell a lot about us. I guess, like most meals, what people eat for breakfast is frequently determined by culture, climate and the work to be done for the day – lighter in warmer climates and heavier in colder climates, or for those doing more strenuous work. Locally grown and produced foods also find a place at the breakfast table and become easily identified as regional specialties. When I was growing up, we ate a lot of cereal for breakfast – usually cold cereal, but sometimes oatmeal or cream of wheat in the winter months. Cereal was quick, easy and relatively inexpensive, and we could fix our own, as soon as we were agile enough to handle a milk carton – a big plus for Mother. We loved cereal, and the sweeter the better. As the littlest consumers in the house, we closely monitored Saturday morning cartoons to stay in the know about the latest cereal varieties. Usually, we’d be stuck with corn flakes or some such boring nonsense, which could only be made palatable to our immature taste buds by adding tons of sugar. I can still see the sludge left at the bottom of the bowl. Sometimes our mother would return from the store with a bright, kid-friendly box of some sugarcoated goodness, complete with a highly touted and much coveted toy prize buried inside. Often I’ve wondered what compelled my mother to buy cereal with prizes inside. Even with my limited mathematical abilities, the potential for morning mayhem from that one little prize was obvious. And yet, even with five kids under one roof during the prize-inside-every-box years, I don’t remember any elaborate family scheme or ritual to determine the prize winner. Nor do I recall any incidents of bloodshed or broken bones – at least not over cereal. How was that possible? My mathematical abilities aside, I did possess an early ability to apply a little logic in extreme life situations and to adapt. Since I possessed only a one in five chance of getting the cereal box prize, I was challenged to think outside the box! While my sugared-up brothers stared at the colorful cartoon pictures on front of the cereal box, I was reading and learning from the back of the box. Box tops! If I could scrape together fifty cents, cut out the coupon on the back of the box, and those precious box tops, I would be rewarded with something much bigger and better than a tiny toy from inside the box. I was on to something! Education is a powerful tool, and as the oldest child, I had two years of reading and printing under my belt. And I was a quick study. Two box tops and fifty cents, along with your name and address to . . . became my mantra. As soon as I had two shiny quarters, there was no holding me back. I taped them to the cardboard form I had painstakingly hand-printed, added the box tops, sealed the envelope, pasted on the four-cent stamp, dropped it in the mailbox . . . and waited . . . and waited. Another lesson learned – patience. Finally, as I came bounding through the door after school one day, and asked for the millionth time if any mail had arrived for me, I got the nod. The big payoff for those two long years of study, not to mention the long weeks of waiting, was inside that box addressed to me. Cornelius the Plastic Wall-Walking Ear of Corn had arrived! All of this came flooding back to me as I contemplated sausage and breakfast and food trends and marketing strategy. And you know me. 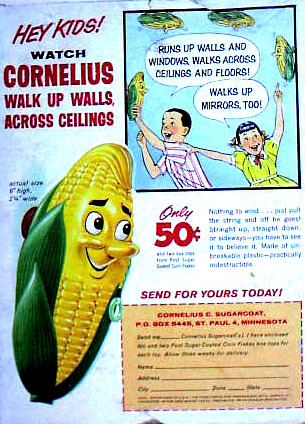 It didn’t take long before I was on the computer, filling the blanks in my memories about Cornelius the wall-climbing ear of corn. Sweet cereal memories, indeed. My tastes have certainly changed over the years when it comes to breakfast foods. I’ve come a long way – from sugary kid cereals, to Instant Breakfast, no breakfast, donuts and pastries, cold pizza, pancakes and waffles, eggs, oatmeal, fruit-yogurt-granola mixtures, bagels, smoothies, and finally back to eggs. I’m sort of like a timeline of the last half-century of food trends. Along the way though, I’ve had some memorable forays into local breakfast specialties wherever I’ve traveled or lived. There was chicken fried steak in Texas, scrapple in Pennsylvania, country ham and sausage biscuits in North Carolina, shrimp and grits in South Carolina, breakfast burritos in California, biscuits and gravy in Georgia, pancakes with real maple syrup in New England, bagels and lox with a shmear in New York, papaya with fresh lime juice in Hawaii, beans and tomatoes in England, and beignets in Louisiana. All memorable, and all delicious. Breakfast is our first chance to make an important decision for the day, and sometimes I still choose a big bowl of cereal, but I’ve given up the sugarcoated kind in favor of the healthier nuts and twigs kind. I also love my own homemade granola with homemade yogurt, and the occasional poached egg on whole-wheat toast. And I still enjoy anything from my list of memorable foods whenever I can. But when it’s February, and it’s cold outside, and I’ve got the whole weekend ahead of me, I need a good reason to rise and shine. I long for a warm and comforting breakfast to linger over. Something like homemade sausage, and maybe pancakes or French toast would be perfect with some seasonal fresh citrus fruits. And after breakfast, I think I’ll go online and check around. Somewhere out there, I know Cornelius must be climbing the walls, just waiting for me. Sift dry ingredients into a large bowl. In a small bowl, add milk and vinegar. Add slightly beaten eggs and oil to the milk mixture. Pour liquid mixture into dry mixture and fold gently. Ladle pancake mixture onto hot griddle and cook until browned; flip and brown second side. Serve immediately with warm maple syrup or keep pancakes warm in 200-degree oven covered loosely with foil. In a bowl, combine diced pork with all other ingredients and chill for 1 hour. Using the fine blade of a grinder, grind the pork. Form into 1-inch rounds. Refrigerate and use within 3 to 4 days, or freeze for up to 3 months. Sauté patties over medium-low heat in a non-stick pan until brown and cooked through, approximately 10 to 15 minutes. Makes 2 lbs. bulk sausage or 16 (2-in.) patties. Note: Adjust the amount of fat and seasonings to suit your taste. Try substituting real maple syrup for the brown sugar. pepper, fennel and sage in a bowl. Add ground turkey and mix with hands to combine. Add maple syrup and combine with hands again. Shape sausage mixture into round patties - about 2-3 inches each. Heat skillet on medium and add olive oil. Cook sausage patties until brown on one side and turn to brown second side – about 5 minutes on each side. Remove sausage patties and drain on paper towels. Serve warm. Preheat oven to 425 degrees. Cut shortening into flour with a pastry blender, or two knives, until mixture is the size of small crumbs. Add buttermilk. Turn out onto floured surface. Knead lightly by folding dough over a couple of times – about 20 seconds is enough. Roll 1/2-in. thick and cut into biscuits. Place on baking sheet and bake for about 12 minutes, until golden brown. Serve with homemade preserves, honey butter, or sausage gravy. Place sausage into a cast iron skillet and break into pieces. Cook over medium heat until brown and crumbly. Remove meat from skillet, leaving 4 tbsp. fat – add a little oil if there is not enough grease left in pan. Stir the flour into the fat with a whisk over medium heat and cook for a couple of minutes. Add the milk to the skillet, stirring constantly until blended – add a little more milk if gravy is too thick. Turn heat up to medium high and continue to stir every now and then until gravy thickens. Add crumbled sausage to the gravy and season with pepper to taste. Serve over hot biscuits. Cut the grapefruit in half crosswise; remove the seeds, cut out the center core and loosen the sections. Place the cut side up in a broiler pan. Mix together the sugar and spices and sprinkle on each grapefruit. Broil until the sugar is bubbly, about 2 to 4 minutes. Serves 4. Wash the orange. Cut off the ends of the orange. Cut the orange in half and cut each half into eight sections. If there is a lot of white pith between the orange and the peel, remove the peel and pull off and discard the white part, before placing everything else in the food processor. Pulse the food processor until the peel is in tiny pieces. Place the processed orange, the water and the sugar in a medium saucepan and bring to a gentle boil. Boil for about 15 minutes, stirring frequently. Cool the marmalade and spoon it into a jar with a tight fitting lid. Store in the refrigerator. Makes one jar. Can't wait to try the turkey sausage and have my in-home judge weigh in on the taste. Also the pancakes with the vinegar. New one to me. Love your "models" included in the breakfast picture. Do you pay them in money or food? DP, those "models" always make biscuits and gravy when they visit us -- and they are always welcome here. No better brothers-in-law in the world! Great post... I can remember pleading with my Dad to let me order 100 magnets! Why I thought I needed 100 magnets is beyond me now LOL. He told me that what I would get probably wasn't going to look like what it did in the catalog, but he finally relented (to teach me a lesson, I suppose). What I got back in the mail was 100 magnets... each one about 1/8" square! I'm guessing that *all* the boxes of sugar-coated cereal that we ate as kids had prizes in them! We make our own venison sausage - can't beat homemade sausage! Love the magnet story. I've probably blocked a few of those memories and just kept the happy ending one! Thanks for stopping by and reading my toy story. I love all your recipes, Im curios and i like to try pancakes with vinegar.I never try this before. This is my favorite article so far! Thank you, thank you for providing me with the opportunity to visit our shared childhoods. I do remember, and fondly, the (what seemed like a cup of)sugar at the bottom of the cereal bowl, and the feel of a quarter taped to cardboard. I wonder if I will EVER get through the pastry and doughnut phase. ". . . the feel of a quarter taped to cardboard" . . . is pure poetry that speaks to the seven year old still deep within me!